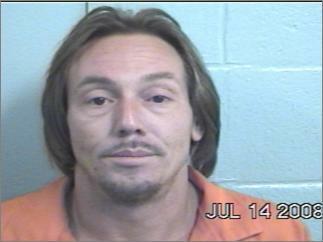 David Mark Anderson already had 2 warrants out for his arrest. Fed Up Neighbors Help Land a Thief Behind Bars, LIVINGSTON, July 15, 2008 - At approximately 4 pm on July 14, 2008, Polk County Sheriff's Deputy, Chris Lima was dispatched to the sub-division of Wiggins Village II in reference to burglary. Neighbors were complaining of a neighborhood thief stealing their belongings. Deputy Lima spoke with the complainants and their anonymous tips led Lima to a mobile home on Lampkin Road. Upon arrival at the residence of David Mark Anderson, 42, of Livingston, Deputy Lima stated that he spotted several stolen items that were described to him by neighbors sitting on Anderson's porch. Further, deputy Lima smelled the distinct scent of burning marijuana. Deputy Lima summoned Polk County Narcotics Deputies Lieutenant Andy Lowrie and Sergeant Howard Smith. When the additional deputies arrived, they requested to search Anderson's residence for more stolen property. 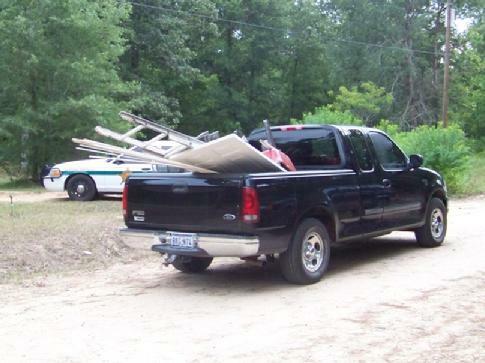 Sheriff's Detectives drive away with a truck load of stolen property. Anderson refused so a search warrant was requested, signed and obtained. Upon searching the residence, deputies obtained literally a truck load of stolen property from Anderson's residence and deputies found a small amount of marijuana. Anderson was arrested and taken to Polk County Jail and booked in for burglary. Anderson already had two warrants out for his arrest. The warrants were for disorderly conduct and failure to appear. Other deputies involved in the search and seizure of stolen property were, Detective Brent Foster, Captain Rickie Childers, Narcotics Deputy Randy Turner, Detective Raymond Lofton, and District Attorney Detective Mark Jones.